The American Legal Democracy Fund, a group with ties to liberal Super PAC American Bridge and headed by former DNC spokesman Brad Woodhouse, filed this complaint in response to reporting by McClatchy earlier this month. The report indicated the FBI is investigating whether a Russian banker with ties to the Kremlin illegally funneled money to the NRA in order to aid President Donald Trump's campaign. "We expect the FEC to get to the bottom of this issue swiftly and deliver the results of a thorough investigation to the American people," Woodhouse said. The banker, Aleksandr Torshin, has ties to Russian President Vladimir Putin. He's also a lifetime member of the NRA and led a delegation of senior NRA leaders to Russia in 2015. On multiple occasions, according to media reports over the last year, Torshin tried to engage with Trump's presidential campaign, seeking in particular to meet with Donald Trump, and through an intermediary had proposed the NRA's convention in 2016 as a possible meeting spot. 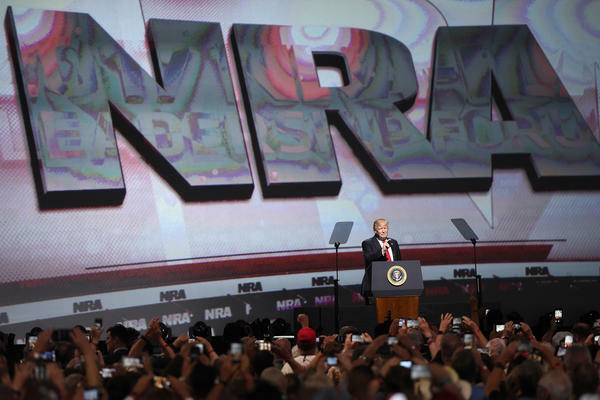 Ultimately, he did not get a meeting, but he met with Donald Trump Jr. at the NRA's 2016 convention.The National Rifle Association spent some $30 million to support Trump in the 2016 presidential race, close to triple what they spent supporting Mitt Romney in 2012. However, no public evidence has emerged showing that the NRA took any money from Russians. "The National Rifle Association has not been contacted by the FBI or any other investigative body," spokesman Andrew Arulanandam told NPR. The NRA's links to Russia were highlighted behind closed doors by Fusion GPS founder Glenn Simpson, the founder of the firm that commissioned a dossier on Trump's ties to Russia during the 2016 campaign. In private testimony before the House Intelligence Committee in November, Simpson alleged closed ties between the Russian government and the NRA. "It appears the Russians, you know, infiltrated the NRA," Simpson told the panel, in a since-released transcript. "It appears that the Russian operation was designed to infiltrate conservative organizations. And they targeted various conservative organizations, religious and otherwise, and they seem to have made a very concerted effort to get in with the NRA." The House Intelligence Committee has looked into this matter, the panel's top Democrat said, but whether it could proceed on a bipartisan basis is unclear. "Whether there was an effort by Russia to create a backchannel or assist the Trump campaign through the NRA is a question the Committee has endeavored to answer," Rep. Adam Schiff (D-Calif.) told NPR. "Much work remains to be done concerning that thread of our investigation, although it is not at all clear that the Majority will permit the Committee to do so." The prospect of having two of the left's most prominent villains caught up in an illegal conspiracy has caught the eye of several organizations on the left, and the ALDF's legal complaint is only the latest salvo in a broader campaign to tie Russia, Trump and the NRA together. "For years, the NRA cozied up to Moscow, even as Russia meddled in our elections. Now they won't answer any questions about it," said John Feinblatt, the president of the group. "It makes you wonder how much the gun lobby really spent on Trump in 2016 and where that money might've come from." And liberal media watchdog Media Matters blared in a headline: "NRA's denial it has illegal ties to Russia hits stumbling block with revelation of FBI investigation." "A scenario in which the Russian investigation ensnares the N.R.A., probably the most influential conservative group in the United States, seems a bit too much like Resistance fan fiction, too delicious to be true," columnist Michelle Goldberg wrote in the New York Times. The ALDF's complaint helps draw attention to the issue, but faces long odds on whether the FEC will actually take action. If it does, the process will take years and would need to work its way through a notoriously gridlocked commission that currently has more Republican than Democratic members. "You should be skeptical about whether the FEC will take any action... Before the 2018 elections, you're not going to learn anything," campaign finance lawyer Brett Kappel said. "The odds are against [an imminent FEC investigation], especially if there's an ongoing criminal investigation. The FBI may contact the FEC and say, please put that on the backburner... and that fact would not be made public."